At Free State K9 we take a balanced approach to obedience training. The first step in training is assessing the goals of the owner and the personality of the dog, then designing a training program around the individual dog and owner(s). We use a balance of correction, motivation and praise to make learning as fun and stress free as possible. Praise from the owner can be worth more to the dog than any treat and teaching the dog to work for praise instead of a treat or toy will enforce that the dog listens even if there is not a bribe present. At the same time- giving the dog fair but effective consequences for unwanted behavior reduces the amount of confusion and makes it as simple as possible for the dog to understand what is wanted. Motivation (verbal) is given throughout the process to encourage the dog who is unsure about what is wanted or who is wavering on the fence about whether or not to listen to a given command. The goal is not to strip the dog of a personality or create "robot dogs." The goal at Free State K9 is to give the dog the education it needs to be a valuable and polite member of the family while still being the happy dog he or she is. You may choose to only get basic on-leash training or you could decide that you want your dog trained through advanced off-leash obedience. Tracking,one of the specialty training options at FSK9. The most popular training option offered by Free State K9 is our Board and Train service. This means that your dog can be boarded on the Free State K9 premises and trained by the Free State K9 trainer. This option is perfect for those who want their dogs trained quickly but do not want to, for whatever reason, train the dogs themselves. 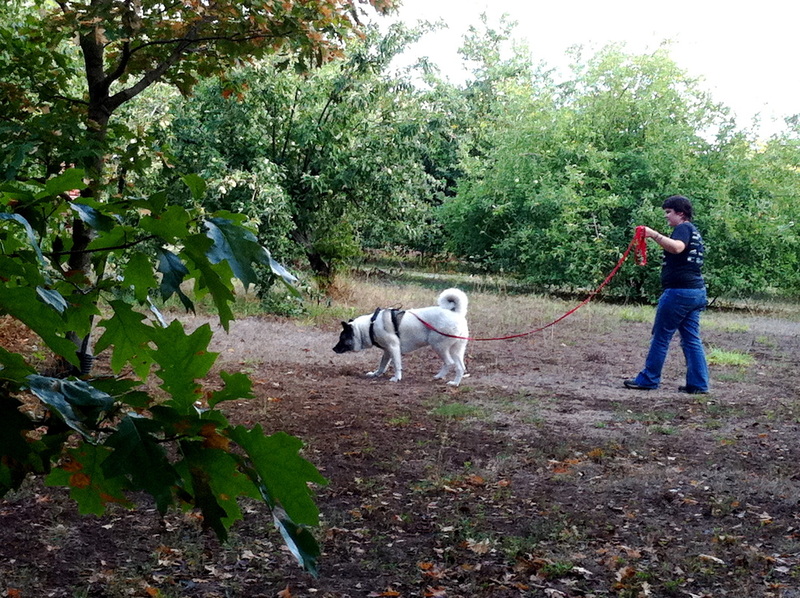 It usually takes under 1 week for on-leash training and 2 weeks for off-leash training (the advanced off-leash package involves the use of a remote training collar). Included in the price of your board and train is 3 followup lessons to make sure that your dog transitions back to life with you easily, the first of which will happen the day you pick your dog up from Free State K9. One of the biggest benefits of a Board and Train is that a limited guarantee is offered on the training. Time slots for Board and Trains are limited so call early if interested. It is not uncommon for Board and Trains to be booked a month out. Once your dog has mastered obedience training there is a whole world of specialized training out there should you want to take your dog further. Scent Detection is not just for police dogs! Train your dog to find your keys or the TV remote. If your dog needs a job to be truly happy in life why not teach him or her to pick things up for you? Keys, credit card, even coins! Specialized training is perfect for dogs who have excelled at obedience training and the owner who has the time and dedication to help them learn. Weekly lessons are a rewarding and cost effective option for small projects or for owners who want the satisfaction of training their own dogs. All weekly lessons are one-on-one with the trainer and no group lessons are offered. Weekly lessons are sold one at a time with no packages, minimums, or limits. They are geared towards the individual goals and needs of dog and owner and if someone has the time, energy, and interest in training their dog themselves it can be a fantastic bonding experience and a lot of fun! Consultations and Weekly Lessons can take place BY APPOINTMENT ONLY between Thursday and Saturday from 10am-Sunset. Email to set up a consultation. 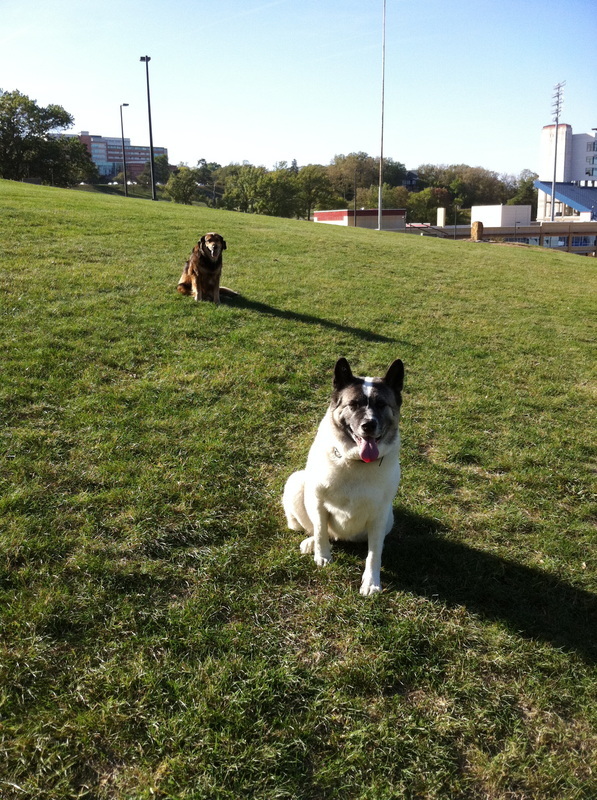 Kylie (foreground) and Ted practice some obedience in the grove on the KU campus.